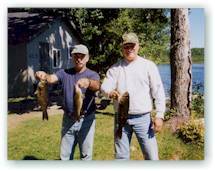 At three miles long, Lake Molunkus offers great fishing variety, for both young and old. Lake Molunkus is home to some of the best smallmouth bass fishing in New England. "Bassmaster Magazine" considers it one of the best lakes for catching that belligerent "bronzeback." 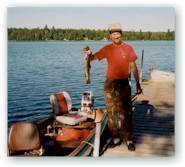 Lake Molunkus also offers salmon, brown trout, white perch and pickerel. It's considered a warm water fishery and catching a salmon or brown trout is the exception. Boat and motor rentals are available at camp. We encourage our guests to practice catch and release of all game fish. This helps protect the valuable fishery and will allow future generations the opportunity to enjoy fishing at its best. There are also a number of streams, rivers and lakes nearby. The well-known Penobscot and Mattawamkeag Rivers are just 14 miles away. If you're interested in native brook trout, nearby streams and beaver ponds can be rewarding. 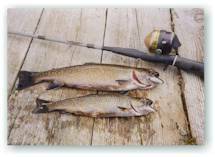 Brook trout fishing is at its best from late May to mid-July.